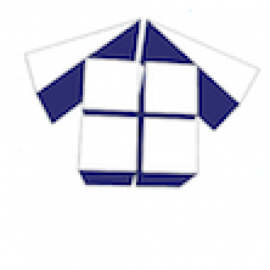 We were recently appointed by a contractor to resolve a dispute between him and his client. 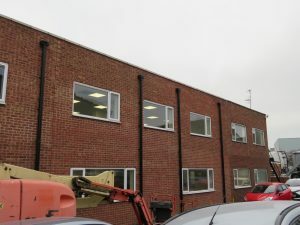 He had constructed a new two-storey extension on a commercial building, which required the new flat roof deck to be connected to the existing flat roof deck. 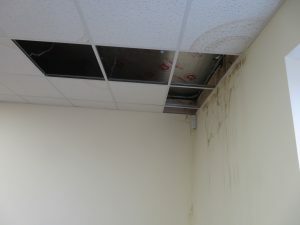 Unfortunately, since completion of the work, the building had been plagued with water leaks. Anecdotally, we were informed by the building owner that since they’d not previously had issues with water ingress, the new roof construction must be to blame. On arrival, we were steered by the building owner to only look at the new section of roof. But of course, we were not appointed by the building owner and it is important that these issues are investigated in a broader context. The roof was circa 300 square metres, and the new section of roof accounted for approximately 25% of the total roof area. Poor falls to the roof deck and subsequent heavy ponding. Failed lap joints to the deck and the parapet wall up stands. Poor junction detailing with the existing roof. Blistering of the roof to the deck and the upstands. Parapet Coping stones supplied and fitted that did not meet the British standard guidelines. Damp proof course poorly installed under the coping stones. Felt upstands not protected by a lead apron flashing. Given the wide range of defects, it was clear that the new section of roof was not fit for purpose. There were numerous areas that could allow water ingress. So should we have stopped the investigation there? In simple terms, no! In my view, that would have been irresponsible and not in the best interests of either party. 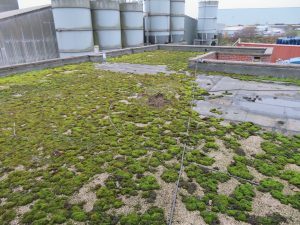 It was immediately apparent that the existing flat roof was as dilapidated as we’ve ever seen and was long overdue replacement. To my mind it simply wasn’t sensible to attempt connecting a new flat roof system to such a heavily damaged existing roof deck. 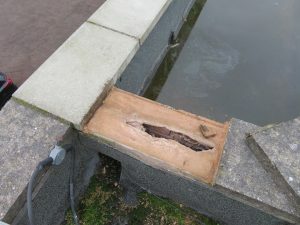 Even if the new section of roofing had been constructed to a good standard, to my mind, there was always going to be a dispute relating to water ingress and who was responsible. 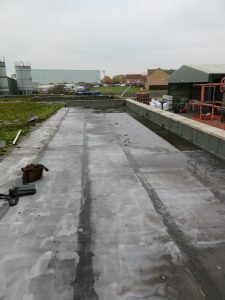 If the existing roof felt was leaking, then water could easily find its way under the new section of roofing; either by direct flow, saturation of the roofing boards, or vapour transfer. Heavy blistering of the felt. Heavy moss growth causing poor rainwater run off. Failed lap joints and evidence or previous running repairs. 4. Parapet wall coping stones not fit for purpose and all copings were dangerously loose. No damp proof course installed under the coping stones. Heavy ponding on the roof. Failed felt up stands which were not protected by a lead apron flashing. Poor falls to the roof deck. Roof boards very soft underfoot, suggesting they’d been affected by water ingress in some areas. Both lists of defects make it very clear can we can expect water ingress to both old and new sections of the roof. 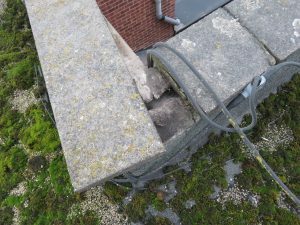 Interestingly, the worst area for water ingress was close to a parapet wall section, where defects were found to both sections of the roof. A focus had been placed on the poor falls in the new section of roofing, and yes, these were poor, but so were the falls to the existing section of roof. Neither issue could be addressed without replacement of the whole roof. I did have some sympathy with the flat roofing sub-contractor, because it was impossible to effectively correct the falls on such a limited area of the roofing. My advice to both parties is that this roof should be wholly repaired, with the owner being responsible for the existing sections of roof, and the contractor being responsible for his defective workmanship. Once the roof was stripped, and roofing boards renewed (as necessary), then falls should be corrected by the use of timber firring strips under the roof boards, or by installing tapered insulation, installed on top of the roofing boards. Physical DPC installed under the copings, with a minimum 150mm overlap between adjacent sections of the DPC, and a hard support bridging the wall cavity, so that the DPC does not drape into the cavity. Coping stones to be mechanically fixed to the parapet walls with stainless steel fixings. 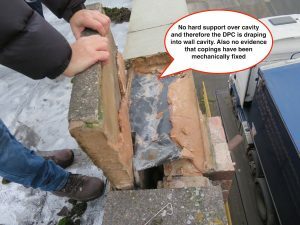 Should Coping Stones Be Mechanically Fixed? 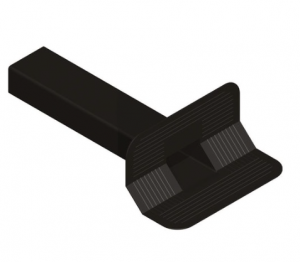 In 2014, BS5534 was changed to make the requirement that ridge tiles must now be mechanically fixed. It is no longer allowable for these tiles to simply be adhesively bonded on a bed of mortar. One might think that this requirement was extended to cover coping stones, but unfortunately it wasn’t. Since a mortar bed alone, would not resist displacement, then clearly parapet copings should be mechanically fixed. The standard then goes on to state that clamps and fixings for copings should be of Austenitic stainless steel construction. 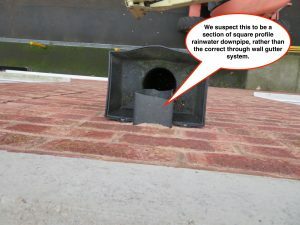 We also advised that the box gutter should be modified to have bespoke, ‘through wall’ outlets installed. This would make it far simpler to bond the torch on felt to the upstands, and also, those upstands, should themselves be protected at their head by a lead apron flashing. There is a fashion now for omitting these lead aprons, and simply expecting the torch on felt to fully water proof the upstand, but in my view, premature failure will always occur with this type of detailing. 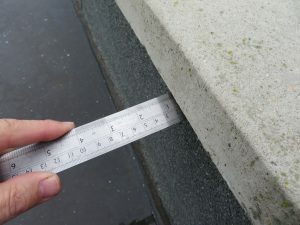 Occasionally the felt is turned under the coping stones, to also act the the parapet wall DPC, but again, this detailing is incorrect, and not fit for purpose. 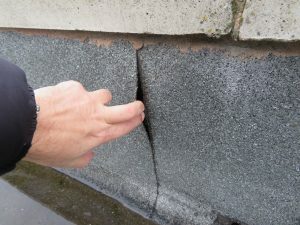 I personally found it hard to believe, that the existing section of flat roofing was not also leaking, but it is a certainty, that the parapet walls were! Pragmatically, it was important that both parties addressed this problem with whole renewal of this roof, or I’m confident that the water ingress will be an ongoing issue.